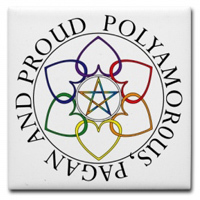 What is clear to me is that Pagans practicing polyamory are as diverse and adaptable as Pagans themselves. Our world has changed from one where the intact 'nuclear' family is the place where the majority of people find intimacy. People universally want to experience love, and they will go through much to have more of it. For some people polyamory is the perfect solution to getting as much love in their lives as they can. I am glad someone is learning all the skills needed to maintain that much love! We can all learn from that.